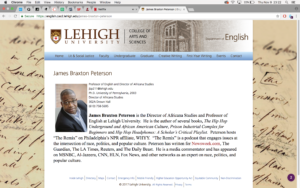 James Braxton Peterson, the director of Africana studies and a professor of English, has been confirmed as the Lehigh faculty member who was accused of sexual and other misconduct last semester, according to an email sent to faculty and staff by the Office of the Provost. The university conducted an investigation into allegations made by multiple individuals against Peterson, and investigators’ reports were provided to Provost Patrick Farrell. Before Farrell made a formal decision about the case, Peterson informed the university he was unconditionally resigning his position. The university did not directly inform the student body about Peterson’s departure. In the fall, Peterson was listed as the instructor for English 318, Contemporary Black Poetics. 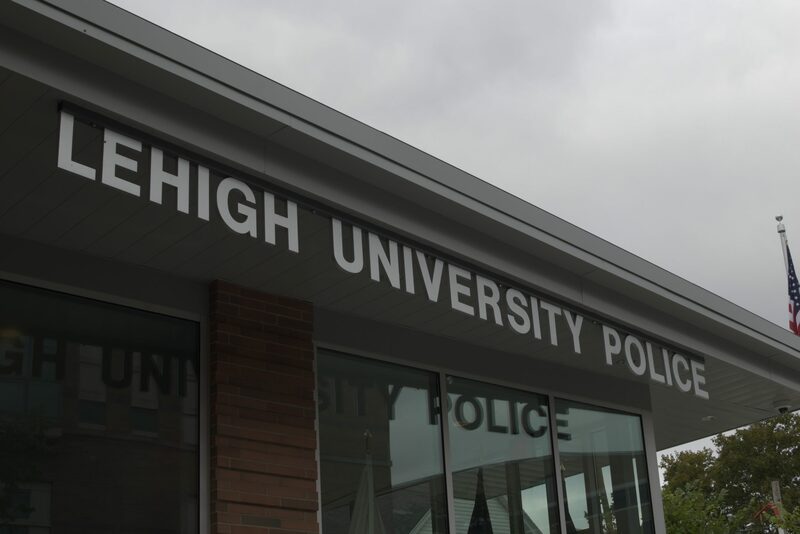 After the initial email was sent out to the campus community in November stating a faculty member was on paid leave after being accused of sexual misconduct, the course instructor was changed to professor Monica Miller on the Lehigh Portal. Several individuals confirmed anonymously to The Brown and White last semester that they had reported Peterson for sexual misconduct. The Brown and White reached out to Peterson and President John Simon and has not received a response as of publication. Farrell, Lehigh University Police Chief Jason Schiffer and English department chair Dawn Keetley declined to provide further comment. The Brown and White has not yet received a response regarding Peterson’s fellowship status. As of Jan. 18, his page on the Hutchins Center website has been taken down. 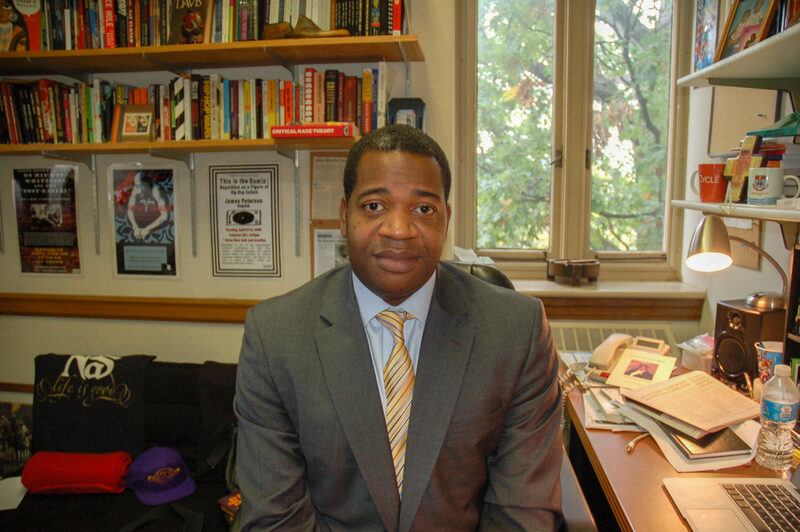 Peterson was hired by Lehigh in the summer of 2011 and, according to the Africana studies page, was “charged with reinvigorating and expanding the program in unprecedented ways.” Under his leadership, a cluster of new faculty was hired between 2012 and 2015, and many new courses were added to the program. 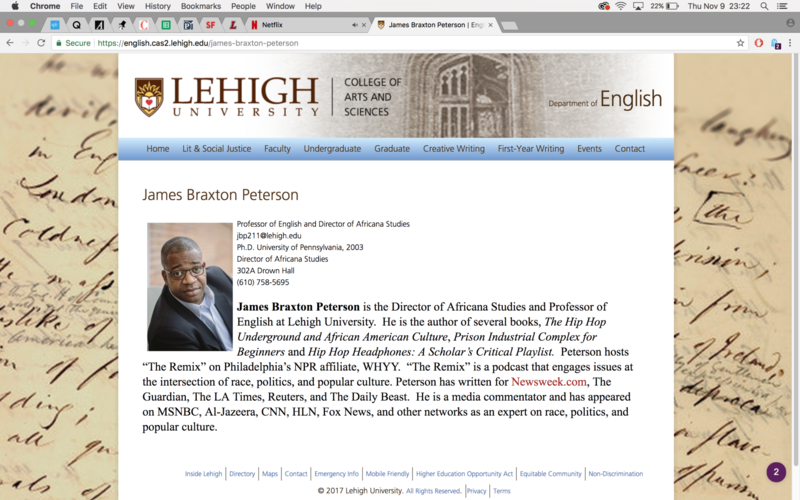 Professor James Braxton Peterson’s profile on the English department website is captured in this Nov. 9, 2017, screenshot. 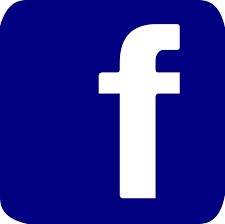 The page is no longer available. Peterson is the author of several books, including “The Hip Hop Underground and African American Culture,” “Prison Industrial Complex for Beginners” and “Hip Hop Headphones: A Scholar’s Critical Playlist.” He founded Hip Hop Scholars, Inc., an association of hip hop generational scholars. He was an MSNBC commentator and the host of “The Remix” on Philadelphia’s WHYY, as well as a contributor to various other publications. “As a result of the statement released today by Lehigh, (‘The Remix’) will no longer be distributed by WHYY,” wrote Art Ellis, the station’s vice president for communications and member relations, in an email. As of publication, MSNBC has not yet responded to The Brown and White’s request for comment regarding Peterson’s status with the network. Peterson’s pages have now been removed from Lehigh’s website. Anyone seeking support can contact University Counseling and Psychological Services by emailing [email protected] or calling 610-758-3880. 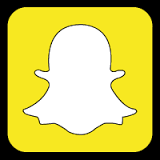 Those experiencing harassment, discrimination, retaliation or sexual misconduct can contact the Equal Opportunity Compliance Coordinator, Karen A. Salvemini, at 610-758-3535 or the Lehigh University Police Department at 610-758-4200. Very disappointing, especially in light of how prominent and well regarded Professor Peterson was in both the University community and beyond. Lehigh seems to have done all of the right things in investigating these allegations, seeing this matter through to an ultimate recommendation of termination regardless of Dr. Peterson’s resignation, and being forthcoming rather than sweeping it under the rug. Thank you to President Simon, Provost Farrell, Frank Roth, Karen Salvemini, and others for your leadership in this. Thanks should go especially to the witnesses who reported the misconduct. Yes, you’re right. Professor Peterson’s esteem and regard, especially among the faculty and administration, afforded him credibility and, in turn, power that likely made it even more difficult for people to stand up and speak out. I’m glad these witnesses had the fortitude to speak truth to power. I would hope this sends a very strong message that at Lehigh this type of behavior will not be tolerated by any member of the academic, support or student population. Where are the accusers? Where are the charges and mandated law enforcement investigation? A police investigation is mandated to occur concurrent with institutional internal investigations? No accusers, no victims, no law enforcement investigation, no charges? Lehigh has a history of a pattern and practice of the abuse of employees of color. Black leadership has been documented to disappear without notice or word over vacation breaks. Former black administrators report persecution by their white counterparts as they silently resign or face termination and sanction as a result of their activism and advocacy. 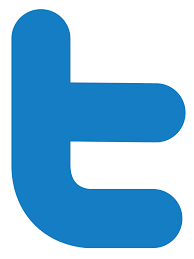 Please readers, question things and do not accept what is disseminated as truthfulness. If you do then mission accomplished. Schools can be tricky. Keep this in mind. Who, exactly, are you in solitary with, Susan? I meant to type “solidarity” in that comment. Susan, it’s really unfortunate that you’re blaming the several victims who came forward to report Dr. Peterson’s actions. This has nothing to do with race and has everything to do with sexual assault and power. Are you suggesting that Lehigh should not have taken these allegations seriously because they were made against a black professor and instead should have kept Dr. Peterson in his position because Lehigh lacks an abundance of professors of color? I don’t think you are, but see how I can shift the focus from sexual assault to racial diversity and discrimination just as easy as you did? I expect better from someone who was among the first cohorts of women to attend Lehigh and who cares enough about the climate at Lehigh to have filed a civil rights complaint against Lehigh with the U.S. Department of Education. Neither this article, nor the email to faculty and staff, addressed whether criminal charges had been or would be filed. We don’t know the nature of the allegations or whether there is enough to prosecute. Perhaps Lehigh does have a history of abusing employees of color. But it certainly also has a history of being hostile to STUDENTS of color. So, Susan, would you have the university ignore the complaints of students of color- students already vulnerable in a campus community that has a spotty track record when it comes to supporting them- in favor of protecting the reputation of an employee of color who was already protected by the tenure process, a national reputation, and his hefty salary? Please, Susan, question things and do not accept your own disseminated unfounded conclusions as truthfulness. If you do- then mission accomplished. Sexual harassment can be tricky when it intersects with hypocrisy. This is about power and privilege. Period. It is regrettable that Dr. Robertson resigned as a result of sexual misconduct . There can be no favoritism or confusing racial advancement with misconduct . When that happens we as a free society will suffer greatly. 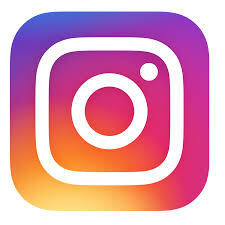 As a black male I must stand against the mistreatment of women , children , minorities etc.